Have you ever tried to use Google Analytics’ out-of-the-box metrics to learn more about how your site is performing? If so, chances are you were trying to deduce if your site visitors are actually doing what you’d like them to do—are they reading to the end of your articles? Are they clicking on the calls to action you’ve provided? Unfortunately, there’s a chance you didn’t find the answers you were looking for. What is a goal/conversion in Google Analytics? As defined by Google, “Goals measure how well your site or app fulfills your target objectives. A goal represents a completed activity, called a conversion, that contributes to the success of your business”. In simpler terms, a goal is a way of measuring how often someone completes a specific action on your site. Whenever someone completes that specific action, a conversion has occurred. The way to measure the frequency of those conversations is through your conversion rate, which is the percentage of site visitors who complete a goal. Why use goals and conversions? Setting up goals helps you measure and compare metrics that actually matter to your business. Sure, keeping tabs on metrics like pageviews, bounce rate and average session duration can be helpful, but unless your site is focused on generating ad revenue, those metrics are not always the most relevant to your bottom line. By setting up goals, you can more effectively measure metrics like the number of clicks on CTAs, number of leads generated, or even number of sales completed. On top of being able to track more metrics, goals make it easier to analyze, report on, and optimize for conversions. When goals are properly set up, you can use Google Analytics’ default reports to see which channels have the highest conversion rate (that is, has the largest proportion of users that complete your goals). This will help you determine if the traffic you get from each channel is actually effective. Setting up goals also allows you to find out how much each page or channel contributes to your bottom line, making it easier to figure out the ROI of various campaigns. 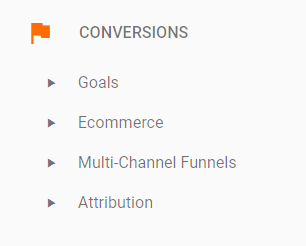 If that’s not enough to get you excited, implementing goals also makes a whole new section of reports in Google Analytics available, including attribution modeling, funnel analysis, and deeper segmentation. In short, goals help you get a clearer understanding of how well your site is performing, using metrics that you define based on your specific needs. 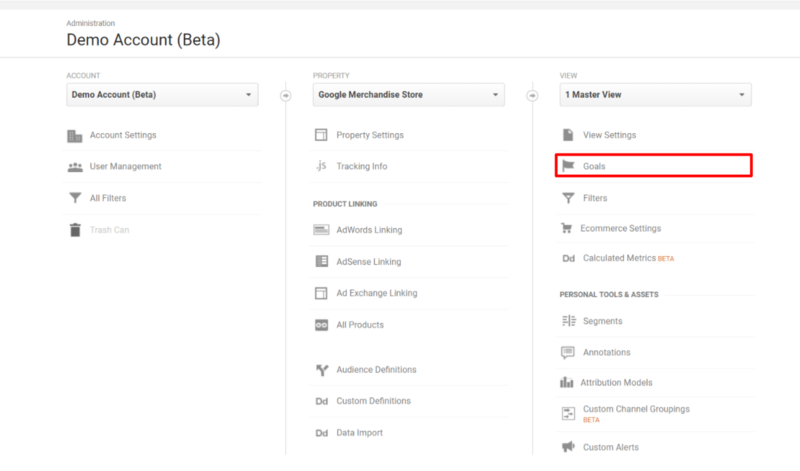 To set up a goal, log in to Google Analytics and navigate to the “Admin” tab at the bottom of the sidebar menu. Once you’re on that tab, choose the account, property, and view you’d like to add a goal for, and click the “Goals” option under the appropriate view. On the next page, you should see the button that says “+ NEW GOAL” in the top-left corner. Click it. If you don’t see that button, it means you don’t have sufficient permissions to add goals for an account. You’ll need to talk to your account administrator to gain access. After clicking the “+NEW GOAL” button, Google Analytics will ask you if you want to use a template or to create a custom goal. Most likely, you’ll want to create a custom goal—it’s more flexible, and just as easy to implement. This guide will focus on setting up custom goals, so select that option and click “Continue”. The next step is to name your goal. Be sure to pick something descriptive, like “Completed Contact Form” or “Clicked a blog CTA”. Then, you’ll need to select a goal type. Event: A goal is completed if an event is completed. Let’s take a look at each of these goal types in greater detail, and walk through how to set up goals of each type. How do destination goals work? Destination goals are most commonly used to measure the number of newsletter signups, resource downloads (like whitepapers or eBooks), contact form completions, or purchases, since many sites redirect site visitors to a ‘thank you page’ after completing one of these actions. To check if this is the right goal type for you, try completing the action (whether signing up for a mail list, or filling out a contact form) and see if you get redirected to a specific page. Double check to make sure that there’s no other way to get to this page—if so, the destination goal type is right for your action! If not, you’ll likely need to use an event goal. After descriptively naming your goal and choosing the destination goal type, the final step is to fill in goal details. For destination goals, there are three details to fill out: destination, value, and funnel. The destination field is where you specify the page (or pages) that will count as a completed goal. To start, enter the slug (the URL, excluding the domains; essentially the URL that comes after the first ‘/’. For example, the slug for this page is “”) of the page that users are redirected to after completing the action that you want to track as a goal. This could look something like “/thanks-for-your-submission” or “contact-form-completed.html”. If you’re not sure what the slug is for your destination goal, go to your site and complete your goal, and check the URL of the page where you end up. One exception here is if your action takes place in a lightbox or a pop up (commonly used for email captures)—if the URL doesn’t change when the user completes the action, you’ll want to use an event goal instead (see below). If the URL you want to assign to this goal is the same each time you complete the action, you’re done with the destination field. Nice work! If the URL changes every time (maybe there’s some extra characters at the end that changes with each action), you’ll have to change your goal’s match type. The next step is to select a value, or dollar amount to associate with this goal. For example, if a lead is worth $10 to your company, you’d enter ‘10’ as the value for this goal. Whenever someone completes this goal, Google Analytics will attribute a portion of the goal value to each of the different pages that the person visited before completing the goal. This happens for every goal that has a value. You can then see the sum of all these goal values by looking at the page value column in various reports to give you an idea of which pages contribute to your goals. The last option for destination goals is to create a funnel—this is beyond the scope of this guide, but if you’re interested in learning more about destination goal funnels, take a look at this article. How do duration goals work? Duration goals are completed when a session lasts longer than a specified amount of time. This means that each visitor can complete this goal once per sessions. This goal isn’t as commonly used as destination, but can be helpful to indicate if readers are spending a long time on your site. This could be a good thing (if you’re a publication looking for engaged users), or a bad thing (if people who are visiting your support site can’t find what they’re looking for), so when using this goal, make sure you know why you’re using it and understand how average session duration is calculated. After naming your goal and selecting duration as your goal type, there are only two fields to fill out for the duration goal: duration and value. As you might expect, the duration field is where you would specify how long a person should be on your site for before the goal is counted as completed. All you have to do is enter your desired duration in hours, minutes, and seconds. The value field is also available for duration goals, and works exactly the same as it does for destination goals. Enter the dollar amount this duration goal is worth to your organization, and you’re done. How do pages/screens per session goals work? A pages/screens per session goal is completed if a visitor visits more than the specified number of pages (or screens, if the view you’re creating a goal for is a mobile app) in one session. Similar to the duration goal, this is another less common goal, and is best used by publishers measuring if readers are reading multiple stories. After naming your goal and selecting duration as your goal type, there are only two fields to fill out for the pages/screens per session goal: pages/screens per session and value. After entering a value into the pages/screens per session field, only sessions where users visit more than the entered value will trigger this goal. In the above screenshot, any session where a visitor views three or more pages will trigger the goal. Next, enter the value this goal is worth to your organization into the value field, and click “Save” to finish setting up this goal. How do event goals work? Event goals are completed when a specific event is fired on a page. Events can cover almost anything—depending on how they’re implemented, they can track forms that don’t redirect visitors to a destination page, they can track clicks on buttons, views of a video, or any other interaction between a visitor and your site. Google Analytics events are very versatile, but can get a bit complex, so we won’t go into great detail here. Instead, take a look at Google’s guide to events—all you need to about an event before you set it up as a conversion are its category, action, label, and value. Once you have your events set up, the following steps will guide you through implementing specific events as goals. 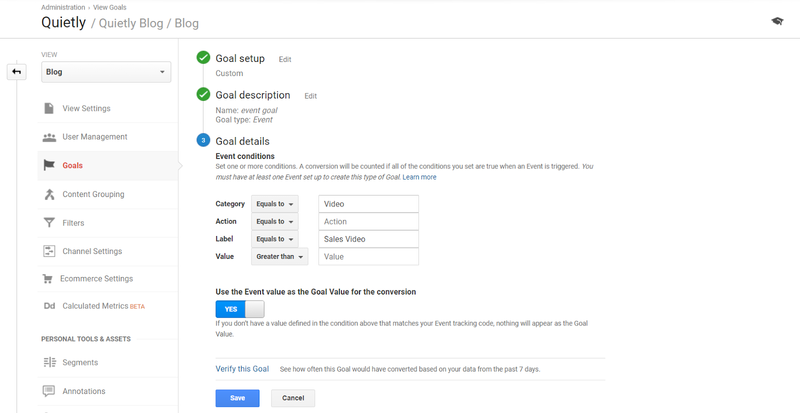 After naming your goal, selecting the event goal type, and implementing a goal somewhere on your site, the last step is to determine the conditions for this goal to trigger. 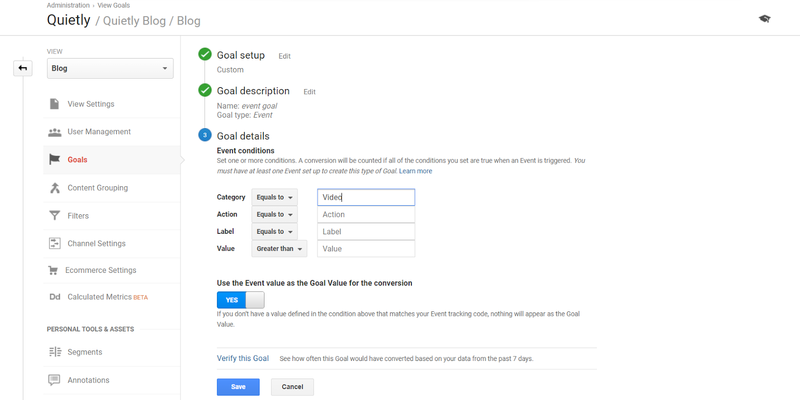 If you know the exact event that you want to use as a goal, input the category, action, label and value of the event into the event conditions field, and you’re good to go. It’s worth noting that not all of these fields are required—you only need to fill out one of these four fields in order to set up a goal. Google Analytics will only count events that match ALL of those fields as a goal. If we set the goal category to “Video” (such as in the screenshot below), and leave the other fields blank, both events will be counted towards the goal. As you could imagine, event goals can be extremely versatile, and allows you to track just about anything on your site. The last step here is the event field. Unlike the other goal types, you can use the event value as the goal value. If you don’t use the event value as the goal value, you can specify a dollar value, just like the other goal types. A good rule of thumb is that if your event value represents a dollar value, it should be used as a goal value. Otherwise, it’s best not to mix up different units of measurement. What do I do with goals once they’re set up? 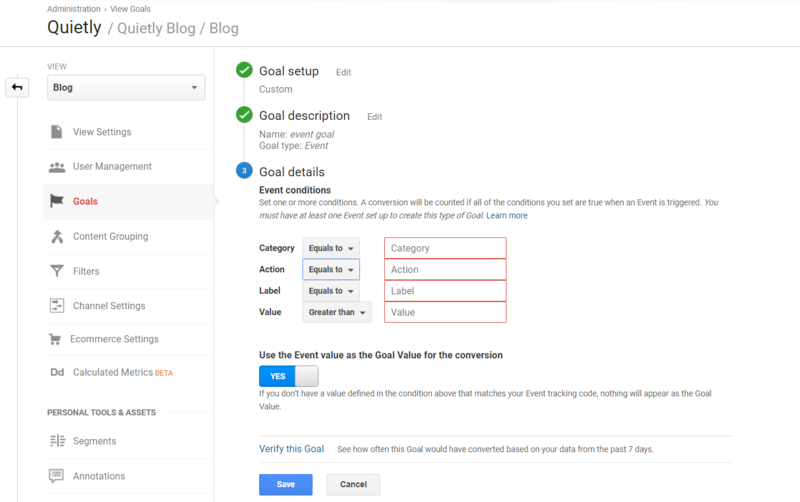 Once goals are set up, you’ll be able to use the various conversion reports—mentioned at the very beginning of this blog post—to use goal completions as a dimension in just about any Google Analytics report. This dimension can help you figure out which channels drive the most conversions, what types of users are more likely to complete specific goals, or even the amount of dollars a page is worth. In addition to this, there are many third party tools that help you report on or visualize your conversions after you’ve implemented them in GA. Goals are one of the most powerful and versatile features Google Analytics has to offer. When set up right, goals can help you more accurately and effectively evaluate how your site is performing based on metrics that matter to you.